High harmonic generation, or HHG, is an extreme high order nonlinear process that converts IR or visible light into extreme ultraviolet and even X-rays. One can simply focus a femtosecond laser beam onto a gas target to achieve the frequency conversion process. Due to its simplicity, table-top size and cost-effectiveness, HHG has been increasingly used as a tunable femtosecond EUV and soft X-ray “laser” source to substitute the much more expensive and larger scale synchrotron source and free electron laser. HHG is opening up new frontiers in many areas of science, such as optics and lasers, biology, material science, and nano-technologies. It creates a wide and bright EUV and Soft X-ray spectral combs that are enabling spectroscopes and microcopies that were previously unimaginable. 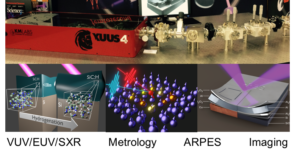 It is particularly useful for research applications involving the generation of “laser” like soft x-ray, coherent diffractive microscopy, and molecular dynamic studies where synchrotron sources are unavailable or impractical. For information about how this leading edge technology can bring new capabilities to your application, contact KMLabs today.